Bill Low’s flagship Audioquest cables were tying it all together in the Marantz room where the latest Marantz SA-12 digital player and Classe amplification were making a high resolution sound with the premium B&W 802 D3 loudspeaker. You’ve probably noticed by now that most product demonstrations were accompanied by educational lectures about the products from local luminaries and experts. It’s not often you get an opportunity to witness the internal construction of a Magico speaker. Shown above is an exposed view of the internal structure and bracing of the best-selling Magico A3. Sadly, I never got to hear the magisterial Sonus Faber Aida loudspeaker in action but next door the related-by-DNA Franco Serblin Ktema seriously impressed with both Audio Research tube and Burmester solid state electronics. Seamless and patently versatile, this is definitely another contender to check out once home. The Bespoke Audio passive preamplifier made a memorable difference when inserted between the already refined sounding and agile Burmester 089 belt-drive CD player and 911 Mk III power amplifier. Here it is in naked form on static display. The Fostex room was packed throughout the show and, like the TAD room, there was often a long queue to get in. Good to know that the DIY community can still make good, competitive sounding products at a salary-man price point. Lothar Wiemann and James Shannon from T+A, (“pronounced T plus A!”), brought new flagship digital sources to the Show to road test prior to their imminent formal release. The full T+A stack provided a very compelling and no less appealing alternative to Nagra while driving the monstrous Avalon Saga speakers with more muscular dynamic resolution and clarity. With its international focus, there was unfortunately no exhibitions of Zanden, Kondo or Wavac at the Show but the Triode Corporation didn’t hold back showing its panoply of tube options with speakers from Spendor and a Kronos Sparta turntable as its analogue source. The Western Electric-inspired TRX-P300M monoblocks with two 300B output tubes per channel (in the middle left of the display) were new for the Show. They come stock with Psvane replica WE300B valves and are rated at 15W into 8 ohms. dCS digital equipment was being used in a number of different exhibitors’ rooms. A key new product introduction was the dCS Bartok DAC. The Bartok is a single box digital music player which combines a network streaming DAC based on technology developed for the Rossini range and a high quality headphone amplifier. 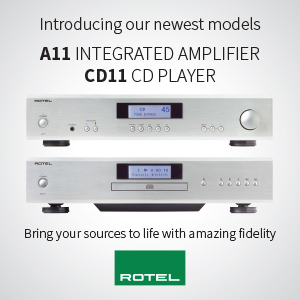 It features DXD upsampling as standard, supports streaming services like TIDAL and Spotify Connect while the head amp provides for both balanced and unbalanced outputs. This is destined to be a flexible one-stop unit. Some glare marred the sound from the explicitly revealing YG Acoustics Sonja 2.2 loudspeakers in a room driven by Krell Industries amplification. But truth be told, once experienced many other box speakers sounded slow and smeared by comparison. On the other hand, there were no such issues with the surprisingly serendipitous pairing of the smaller YG Acoustics Carmel with Airtight tube equipment, a Transrotor turntable and My Sonic Lab cartridge. The sound was full, supremely musical, and entirely fatigue-free. The Airtight room was one of the most successful and musically enjoyable of the Show. The welcome resurgence in the use of vintage tape decks at the Show vindicates just how good the medium can still be. A tasty vintage Nagra T made for convincing musical playback in the Mola-Mola/Lansche Audio room and an arcade game-sized Amperex appeared in the Stella room. But arguably the most impressive demonstration of the sonic prowess of master tape was in the EAR Yoshino room where the inimitable Tim de Paravicini (here holding a Simon & Garfunkle Greatest Hits tape box) used an old TEAC machine in a champion sounding room that also featured the EAR912 Studio preamplifier and stacked falcon LS3/5a’s. Oh my, such good sound and so much fun. Jeff Nelson of Boulder told me that he had been coming over to Japan for the past 23 years. He intimated that there were to be some very interesting future product releases from Boulder in the works including an apartment- and rack-friendly new 150-watt power amp in the 1xxx - series as well as new ‘do-it-all’ digital hub. This was my first opportunity to check out the new, relatively affordable, and therefore economically significant, Boulder 508 phono stage and it blew me away – every damn time I came back to hear it. In a system comprising a Luxman / Ortofon front end, Boulder 1110 preamp, the 2017 Stereo Sound magazine prize-winning Boulder 1160 amplifier and big Westlake monitors, its sound was archetypal Boulder: fast, detailed, dynamic and fundamentally distortion free. Moreover, it had natural born boogie and a warm, inviting musicality, no matter what the musical selection. It was positively addictive and I need one bad. I have used Lyra Audio cartridges exclusively for more than 20 years and still covet the legendary Lyra Connoisseur preamplifier which, once heard, is never forgotten. So it was an absolute honour to finally meet my own personal Hi-Fi hero, Jonathan Carr (right), and Stig Bjorge of the wonderful Tokyo based company. The Kiso Acoustic room, along with TAD, were the best sounding rooms at the Show for my money. Officially launched at the Show, the diminutive by design HB-N1 standmount loudspeaker has a new plywood cabinet, a matt finish, and a new tweeter (which replaces the horn loaded one in the award winning HB-1 precursor). 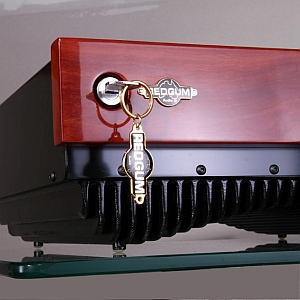 Tellingly, the speaker design draws on extensive research into tonewoods and cabinet vibration by the Takamine guitar company. Fed with the new Pass Labs XP-22 preamplifier and a Pass Labs X350.8 power amplifier, the sound had breathtaking scale, drama, natural detail and stereo focus. Not once did I feel short changed by the bass and not once did the tiny speaker show any signs of strain or confusion, no matter how complex the musical signal being transduced. Most importantly, it had the strongest emotional pull I experienced at the Show. Simply incredible. How often do you hear seemingly perfect time and phase coherence when you walk into a room at a hi-fi show? When I walked into the TAD room, I was immediately transfixed. The sound coming from the new TAD E1TX loudspeaker (and the new TAD M1000 amplifier) was very, very special indeed. Applied for the first time in a TAD floorstanding full range design, the coaxial TAD E1TX has unique ports on the sides of the speaker cabinet. The sound was truly magical. 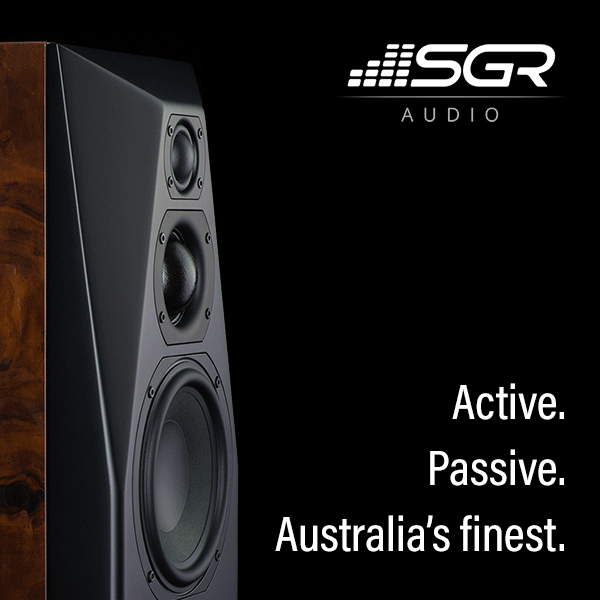 Rich, powerful and natural across all parameters, with deep and wide staging, this extraordinary loudspeaker is going to be the one to beat at or anywhere near its price point. Another incredible performance, to be adjudged not just by very high show standards. Well, that’s all folks. I hope I’ve done justice to a very high quality Show and cannot wait to go back again next year. Finally, I’d particularly like to thank Aki Aoyagi of DS Audio whose bilingual skills were essential a number of times during the Tokyo International Audio Show.